Ground teams analyzing data from a heat probe that got stuck soon after it started digging into the Martian crust under NASA’s robotic InSight lander still hope they can free the mole from an obstruction that halted its progress more than a month ago, but the mission’s chief scientist says the chances of completing the heat probe experiment — one of InSight’s two main science instruments — may not look promising. 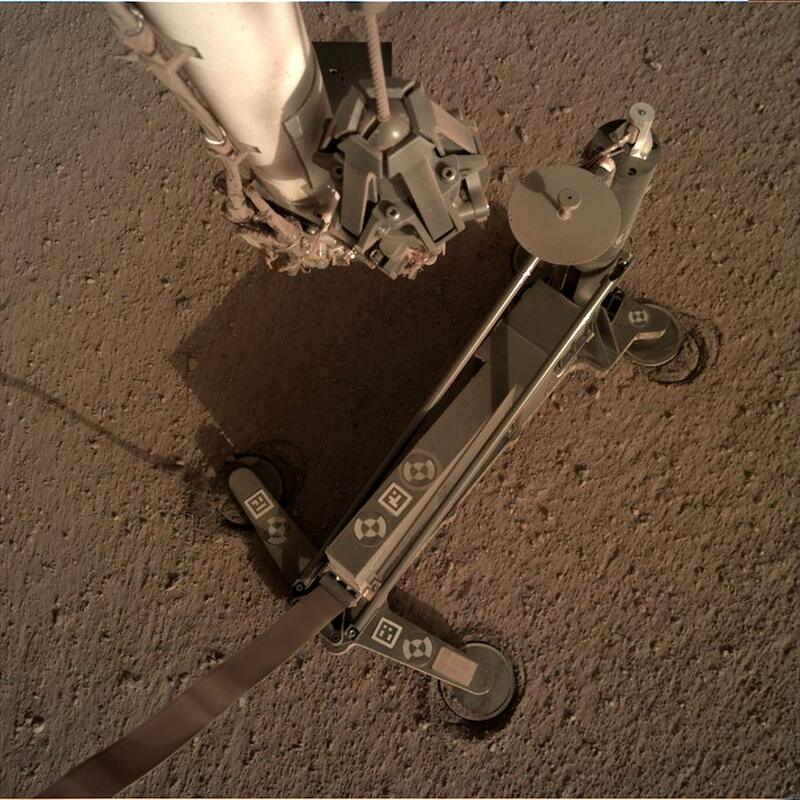 The InSight lander’s robotic arm deployed German-built Heat and Physical Properties Package — known as HP3 — on the Martian surface in February, the second of two science instruments placed a few feet from the spacecraft since its landing Nov. 26. HP3’s metallic mole began burrowing into the Martian soil Feb. 28, aiming to reach a depth of up to 16 feet (5 meters) — deeper than any previous Mars lander — with a series of thousands of hammer blows planned in several stages over several weeks. But within minutes, an obstruction stopped the mole at a depth of roughly 1 foot (30 centimeters), diverting the probe to a tilt of roughly 15 degrees. Another four-hour hammering session March 2 produced no further progress, and mission managers ordered a stop to the digging operation to allow engineers to evaluate the situation. Developed by the German Aerospace Center, DLR, the HP3 instrument is designed to gather data on underground temperatures at varying depths, giving scientists a clearer understanding of the amount of heat escaping the Martian interior. HP3 is one of two geophysics instruments InSight carried to Mars, along with a French-built seismometer, which scientists say is working better than expected. Officials suspect the mole hit a rock, with about three-fourths of the metallic probe’s 16-inch (40-centimeter) length embedded in the ground, and the back end of the mole still in a support structure at the surface. A long umbilical tether with a series of temperature sensors trails out the back of the spike to route thermal conductivity data back to the lander for downlink to scientists back on Earth. Bruce Banerdt, InSight’s principal investigator at NASA’s Jet Propulsion Laboratory in Pasadena, California, said March 26 that ground teams are assessing the possibility of moving the surface support structure using the lander’s robotic arm. InSight is a stationary spacecraft, so the options to relocate the HP3 instrument’s surface structure are limited. There is no reverse motor on the mole, eliminating the possibility of relocating the instrument without using the robotic arm, an operation scientists consider risky. Engineers have used InSight’s cameras and seismic sensors to diagnose the HP3 instrument’s situation. 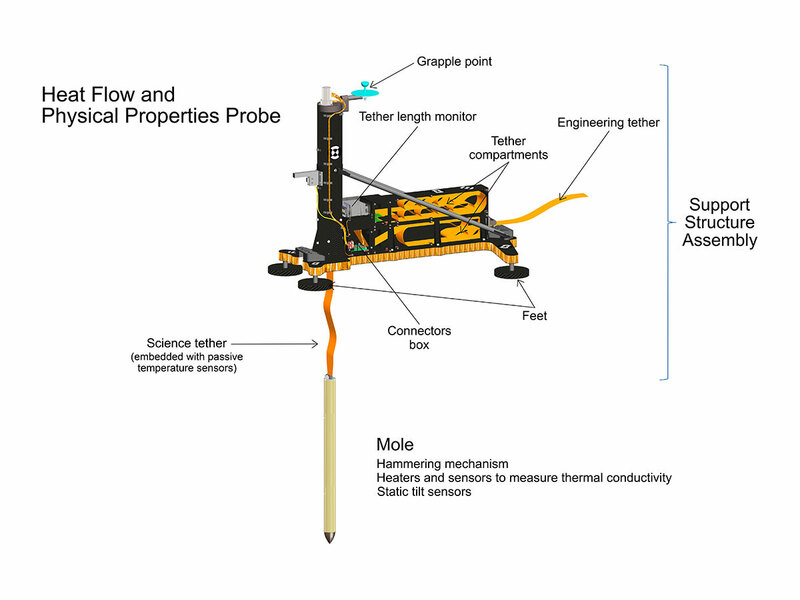 During a third short hammering session March 27, ground controllers tuned the lander’s seismometer to listen to the vibrations created by the mole in an attempt to assess whether the probe is pushing against a single rock or a thick layer of gravel. “The character of the seismic signal is changing, especially between the initial hammering … There are changes happening in the response,” Banerdt said March 26, referring to the seismometer’s measurements of the probe’s first hammering operation. Using a mode in the seismometer that allows it to collect up to 500 measurements per second, scientists hope to use one of InSight’s science instruments to help rescue another. 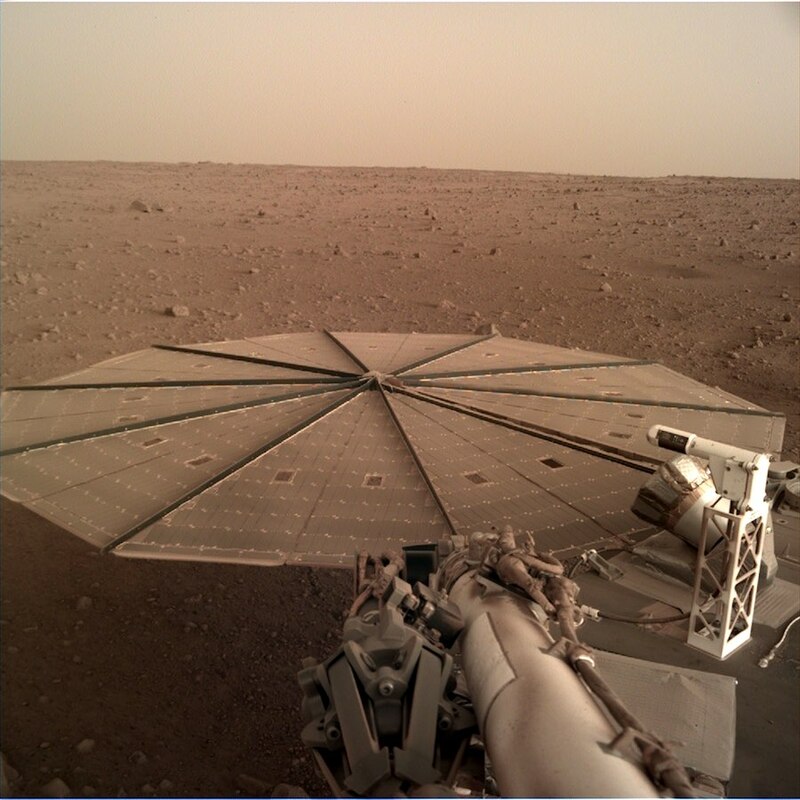 Cameras on the lander were also positioned close to the HP3 instrument’s surface structure to watch for any movement or rotation. In an email to Spaceflight Now on Tuesday, Banerdt said ground teams continue to downlink the high-rate seismic data collected last week. The mole’s hammering mechanism has a limited lifetime before its components wear down, according to Tilman Spohn, the principal investigator for the HP3 instrument at DLR. But officials are not worried about breaking the mechanism in the short term, he said. 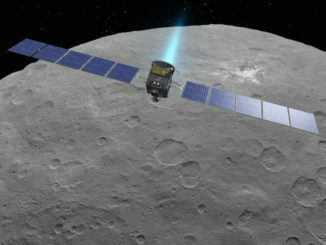 Engineers have also considered the possibility that the instrument’s probe is snagged in its housing in the support structure, but Spohn believes that is unlikely. Ground teams are using a replica of the HP3 instrument on Earth to help understand the problem. 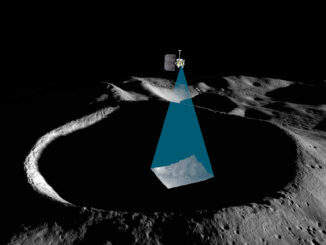 In a presentation March 18 at the Lunar and Planetary Science Conference near Houston, Spohn said a “last resort” for teams to try to get the instrument back on track could be to use InSight’s robotic arm to press on the support structure to try and force the mole through the underground obstruction. Banerdt said InSight’s seismometer, which the lander placed on the Martian surface in December, is collecting good data. 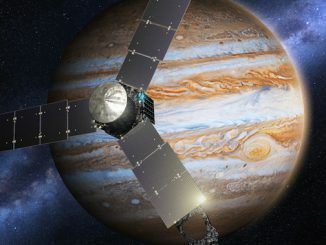 InSight’s robotic arm covered the seismometer package with a wind and thermal shield in February, vastly reducing noise, or interference, levels in instrument’s seismic measurements to levels comparable to seismometers on the moon, where there is no atmosphere or environmental perturbations. InSight’s science mission is planned to last one Martian year, equivalent to two Earth years. Banerdt’s science team designed InSight’s mission to combine the heat probe and the seismic results to map the interior layers of Mars. The data will help researchers learn how the rocky planets formed in the ancient solar system, providing a comparison for what geologists already know about Earth. A third major science investigation on the InSight mission is the Rotation and Interior Structure Experiment, or RISE, which will use radio signals passed between the lander and Earth to measure the wobble of Mars’s rotation, giving scientists an idea of the Red Planet’s core size and density.